Airbus Helicopters, comprising all commercial and military helicopter activities. Furthermore, the Group is launching procedures to change the legal form of its holding by 2015: Once renamed, Airbus Group N.V. shall turn into a European Company, Airbus Group SE (Societas Europaea) which will continue to be registered in the Netherlands. “We are a pioneer for European industrial integration. It is a logical step and high time that our multinational culture is also mirrored in our legal structure,” said Enders. This legal conversion has no impact on the organization or operations of the Group. Both the legal name change into Airbus Group N.V. and the conversion of the legal form into SE are subject to approval of the Annual General Meeting (AGM) of Shareholders: while adoption of the new name is expected at the AGM in May 2014, the legal conversion is targeted for approval in May 2015. These steps complement the transformation process of the Group. In less than two years, the company has not only modernised its governance, broadened the shareholding structure, and united the Headquarters but also thoroughly overhauled its company strategy and launched the integration of the defence and space businesses. 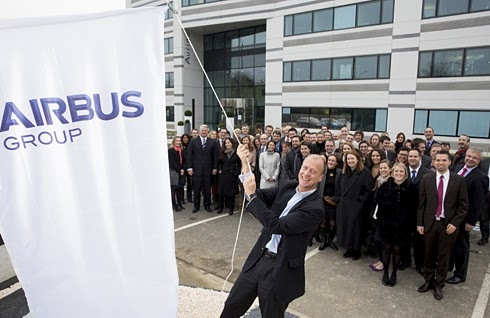 Airbus Group is a global leader in aerospace, defence and related services. In 2012, the Group – comprising Airbus, Airbus Defence and Space, and Airbus Helicopters – generated revenues of € 56.5 billion and employed a workforce of over 140,000.